Want to get the most from the USPS Summer Postage Sale? If you aren’t already aware, the USPS is offering an upfront 3% discount on Standard and First-Class mail, letters and flats, that include a 2-dimensional barcode (QR Code) this July and August, 2011. 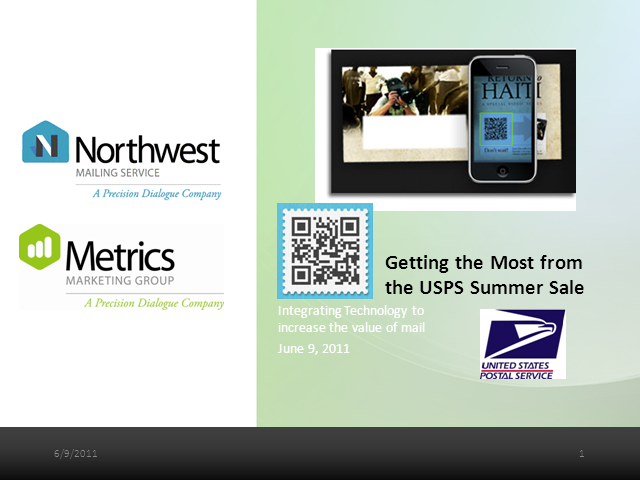 Spend an hour with Metrics and our sister company Northwest Mailing Service to learn how to get the 3% discount, how to best use the QR Code to enable your customers, and how you can get information about each person that scans the QR code on your mailer.